Rep. Gabrielle Giffords rides motorcycles and married an astronaut at a wedding where everything had to be biodegradable. She is a Democrat who champions gun rights, lists fiscal discipline as one of her top issues and was re-elected in a conservative district when Republicans took control of the House. News that she was shot in the head while meeting with constituents at a Tucson, Ariz., grocery store brought outpourings of support from both sides of the aisle. "I am just heartbroken. Gabby is more than just a colleague -- she's also a friend," said Arizona Gov. Jan Brewer, a Republican. Giffords, 40, is a political centrist who voted with her party less than half the time and opposed Nancy Pelosi as the party leader in the House after Democrats lost the majority in November. We don’t yet know what her would-be assassin was thinking. But we do know that Giffords, the first Jewish woman that Arizona sent to Congress, has been the target of a long campaign of right-wing incitement. And Loughner, while clearly in the grip of delusion rather than any coherent ideology, nonetheless shared many far-right obsessions. At a press conference following the attack, the Pima County Sheriff, Clarence Dupnik, blamed political vitriol for fuelling the attack. That did not stop Palin from declaring Giffords a "target." 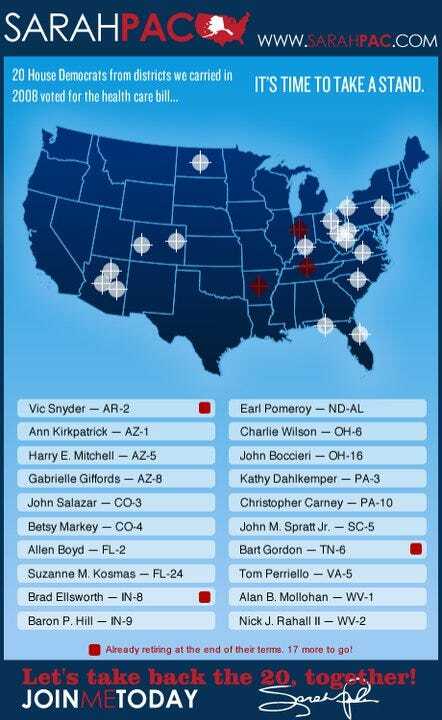 Giffords' district office was subsequently vandalized, and the congresswoman noted that Palin had put "the cross hairs of a gun sight over our district." "When people do that, they have to realize that there are consequences to that action," Giffords said.